Kunming's Jiren Teahouse, with more than 100 years of history in the capital of Southwest China's Yunnan Province, held a founding ceremony for a new club on October 10. People from different generations and countries gathered for the occasion, the only thing binding them all together is that they are the descendants of the Flying Tigers. The Flying Tigers, or the 1st American Volunteer Group (AVG) of the Chinese Air Force, was a volunteer American fighter unit that fought in China and Myanmar against Japanese Imperial forces in 1941-42. After the US entered World War II, the AVG was absorbed into the US Air Force, but retained its nickname. It was composed of pilots from the US Army Air Corps, Marine and Navy Corps commanded by General Claire Lee Chennault, who officially retired from the US army in 1937, and went to work as an aviation adviser and trainer in China. The Flying Tigers was divided into three squadrons: two squadrons based at Kunming, and a third at Mingaladon Airport near Yangon, Myanmar. The shark-faced nose art of their P-40s fighter jets brought them their nickname. Originally, American pilots believed that as Japanese people rely on fishing for sustenance they might be afraid of sharks, but the local people in landlocked Yunnan had never seen shark before and they guessed the nose art was a tiger and called the jets "tigers with wings." Huang Tingyao, the father of Jiren Teahouse's owner Huang Jiming, was an interpreter for Chennault. Huang Jiming told the Global Times that every year, many people from the US, Hong Kong, Taiwan and Europe come to Kunming to explore the history of the Flying Tigers. "Some of them are historical researchers but mostly they are descendants of the Flying Tigers' pilots and other relevant personnel," she explained. "However, most of them can't read or speak Chinese, and have no friends in Kunming, so we decided to use our teahouse to provide a place for these people to have meetings and communication," she said. "The Flying Tiger Association of Kunming already plays the role of a liaison office but they have limited space and funds, so as a descendant of the Flying Tigers, I have the duty to contribute to the remembrance of this history." Nowadays, every Monday afternoon, from 2 to 5 pm, the teahouse provides free meals and space for all the descendants of the Flying Tigers pilots, support staff and administrators in Kunming to meet each other. Huang Jiming also shared the story of her father with the Global Times. "My father was an employee of the Bank of China in Shanghai's foreign concessions during the war, and as he could speak fluent English, the Kuomingtang government contacted him and urged him to go to Yunnan to help Americans train Chinese pilots and other personnel," Huang Jiming said. "Therefore, my father gave up his stable life in Shanghai and went to Kunming without telling his parents," she said. "At that time, Japan had already invaded Shanghai and he was just 22 years old, so my father was a very patriotic and brave man." 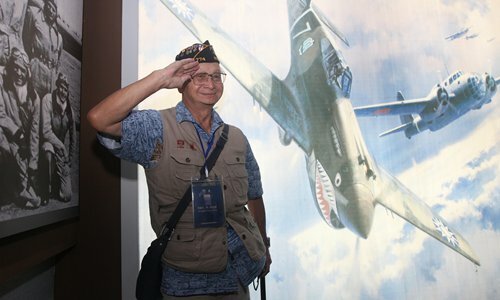 Jesse Millett, an American resident of Kunming whose grandfather, Clinton Millett, was the former vice-president of the 172 Hospital in Kunming and also a military doctor for the Flying Tigers, told the Global Times on Tuesday that he has been told stories about the Flying Tigers since he was a kid. Jesse said his grandfather arrived in Kunming in 1944 and apart from being a military doctor he was an amateur photographer and took a lot of pictures of Kunming at that time. In April 2004, Jesse's uncle Gregg Millett put these photos on display as part of an exhibition organized in Kunming by a Chinese explorer Jin Feibao. "That was extremely popular, around 300,000 came to the exhibition," Jesse said. "My uncle influenced me deeply, and in the US, the history textbooks do not tell us about this part of the history of World War II," Jesse said. "So it is very important for us to tell our next generation that China and the US also had a very unique friendship during the war." Now, Jesse has married a Kunming girl and they have a son nicknamed "Little Flying Tiger."